BAMM stands for Beach Arts Music Mentoring, a group that is busy enhancing the learning experiences of local children in Colonial Beach. The group was established in 2017 and a lot of progress has been made toward their stated goal. I attended one of their early meetings and was so impressed by the talent, enthusiasm and caring attitudes of all involved. I'm so proud of them and all they have and are accomplishing! I was more than happy to help out at their inaugural concert held on September 30, 2017. This was the very first benefit show they held. It took place on the grounds and the outdoor stage at the Colonial Beach Community Center. In early 2018, they presented each of the schools with funding to be used at the principals’ discretion to benefit the teachers and students. In April of that year, they helped sponsor the musical put on by the Elementary and Middle School. Later that spring they set up a table at the Earth Day celebration on Town Hill where volunteers helped the kids with face and rock painting, Terra cotta clay pots were supplied and after painting they were filled with small succulents. BAMM volunteers manned various booths at the Potomac River Festival in June. During that summer they took part in numerous activities on Town Hill, assisting kids with rocks, pots, and sand dollars painting as well as face painting. They helped the kids decorate and take home notebooks for use at school, and even had the kids build and paint a whole mini town made of cardboard boxes. 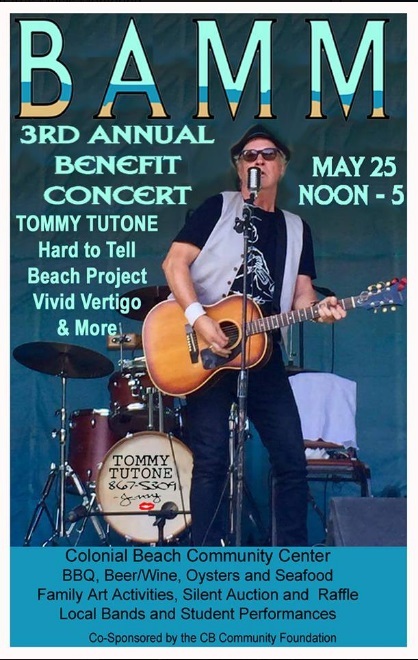 On July 28 they put on the 2nd Annual Tommy Tutone Benefit concert through the combined efforts of over 65 volunteers. BAMM board members voted to donate $2000 of the profits to the Torrey Smith Rec Park. Group members attended the Colonial Beach Schools Back-to-School day and had a table at both the Elementary and High Schools where volunteers handed out notebooks and information about the group to both parents and students. They supported and recruited volunteers to help at the Northern Neck Beach Music Festival which was a rousing success. Board members delivered three $1,000 checks to the school principals for use in helping teachers with classroom supplies they need or for programs they want to start. The BAMM board has voted to replenish these funds as needed. At the homecoming football game in October, BAMM had a drawing among high school students for two new tennis rackets as well as being one of the sponsors of the new printed sports programs. The legend and history of Jack-o-Lanterns including: getting small pumpkins for each of the students, helping them create a design, and letting them paint the pumpkins and take them home. Information on how snowflakes form with patterns that they could use to draw and cut out snowflakes to take home along with snowflake ornaments to enjoy at home. How to create cartoons with small four panel frames for them to think up a story and then draw and color in cartoon-style. A yoga session presentation for the kids in the gym. A session of yoga games for relaxation. Creating a collage about themselves using pictures, articles, and drawings from magazines. During December and January BAMM and many volunteers worked with Coach Steve Swope on the planning and promoting of the Dinner/Dance with the Fredericksburg Big Band at The Riverboat for the benefit of both BAMM and the Torrey Smith Recreation Park. The group's hard work continues in 2019! Two board members participated as presenters in the Colonial Beach High School Career Day. On February 4th they held the first meeting of the High School Music Club which BAMM helped to organize. Arlene McKenzie will be facilitating the club for BAMM. The school has been including information on the meeting in their daily announcements, and there were about ten students in attendance. BAMM supplied pizzas and vitamin waters which they all enjoyed. Group leaders had them introduce themselves and relay what their interests were. Some had extensive music experience, a few were novices, and one had no music experience but was interested in learning. They were a bright engaging group who were all anxious to learn and be more involved in music. BAMM arranged for a local photographer to go into the Yearbook class at the High School to help the kids with planning, composing, framing and cropping photographs for the yearbook. BAMM is currently working with the art teacher in the high school on a project in which her students are going to paint mailboxes with various beach themes. The mailboxes are being purchased with the funds given to the school. When these mailboxes are finished, they will be auctioned off at the benefit concert in May. On Feb 15th at the music club meeting, two local musicians attended and did a program for the kids on bands and playing in public performances. Arlene is preparing a curriculum to use in teaching the music club students how to read music. Board members met with the drama club teacher at the High School. BAMM offered to help with costumes and props, stage and set design and building, and promotion. A call went out to the volunteer community to see if anyone had experience with backstage work at a play or musical. The costume and prop list will be published to see if folks might have old clothes or other items they could donate.